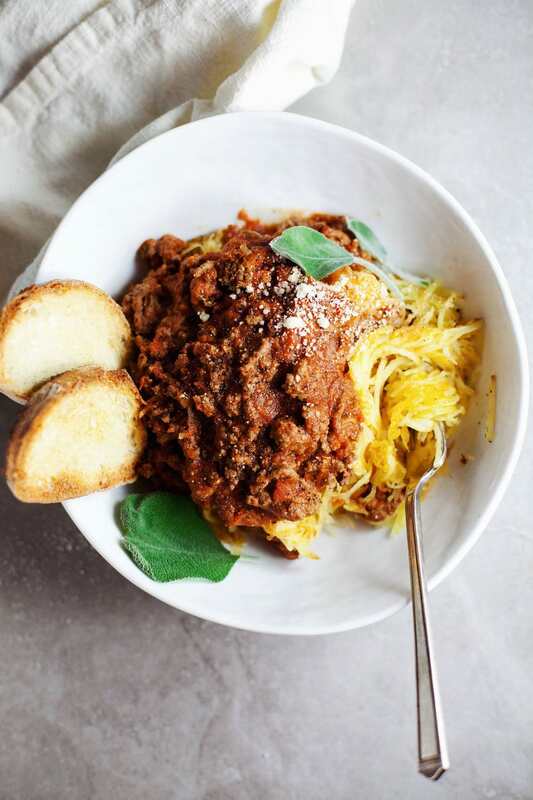 Any spaghetti squash fans out there? ?? If not, I’m about to make you a believer. Because this recipe rocks! This delicious dish is all about simple. 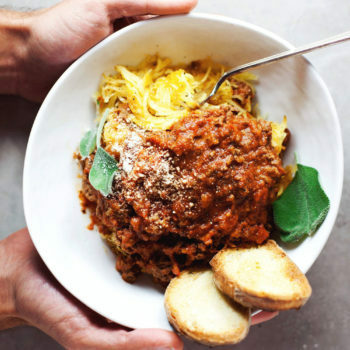 Find your favorite jarred pasta sauce, pop that spaghetti squash in the oven, and you’ll have a delicious + satisfying dinner in no time. Normally on any given day I will scarf down any and every pasta. I’m that weird person that finds so much joy in making pasta sauce, letting it cook for hours, and bringing to the table a hearty pasta dinner. I grew up in a family from Jersey/Queens, NY that lived and breathed Italian food. So, that being said, it’s one of my weaknesses. So during the week I try to keep it healthy by making veggie pasta! If you aren’t big on converting vegetables into pasta replacements, I hope this recipe converts you. Because it’s DELISH. Drew and I are HUGE on pasta, but as of late have been eating lots of zucchini/spaghetti squash pasta’s to lighten things up. 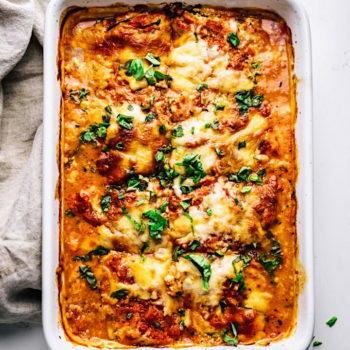 Because we all know fall/winter brings on the hybernation, give me comforting food feels – so squash is my go-to to help those weeknight pasta craves. And adding a bolognese sauce is the perfect way to get protein when you have a veggie as the main ingredient. 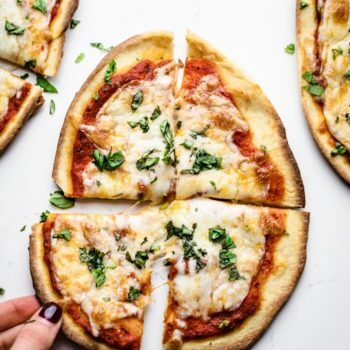 This recipe is in EVERY way delicious, healthy, and all that I desire on a crisp fall evening for dinz. 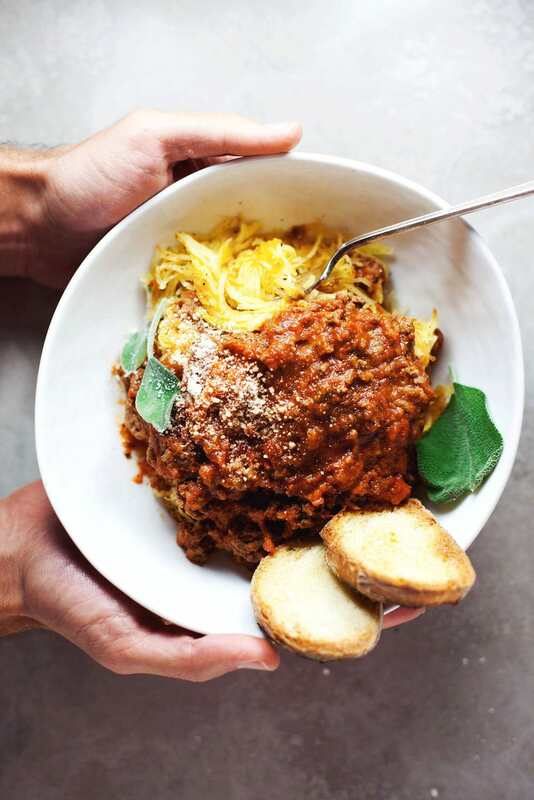 Simple Spaghetti Squash with Bolognese sauce - a healthy way to enjoy pasta and load up on vegetables! Preheat oven to 400Place spaghetti squash in microwave for 4-5 minutes to soften. Cut in half and scrape seeds out. Brush inside squash with olive oil, season with salt and pepper and lay face down on a sheet pan. Place in oven for 30 minutes until inside is soft and you are able to scrape into spaghetti with a fork. While squash is in the oven, in a medium pot on low heat, saute minced garlic in olive oil for half a minute until aromatic. Add ground beef, salt & pepper and let cook on low-medium heat stirring often until beef has cooked through. 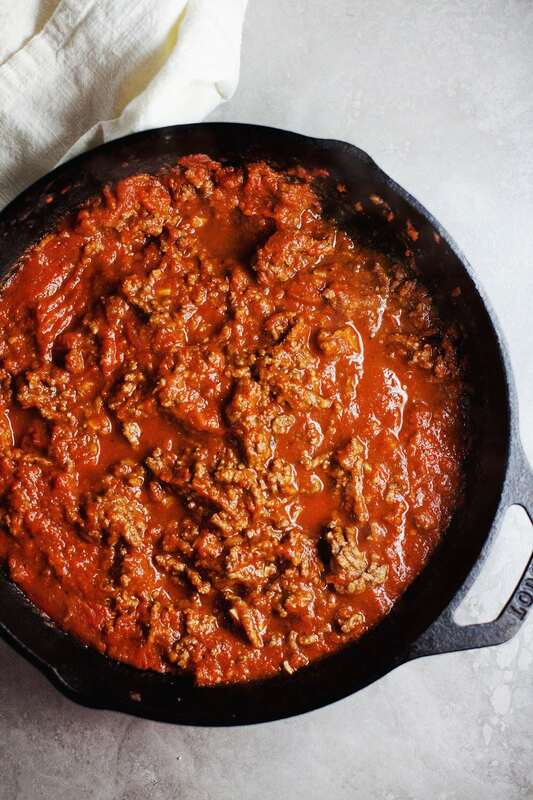 Add crushed tomatoes to cooked beef. Salt and pepper to taste and let sauce simmer on medium heat for 15-20 until it's thickened, stir often. Add herbs to sauce at very end. 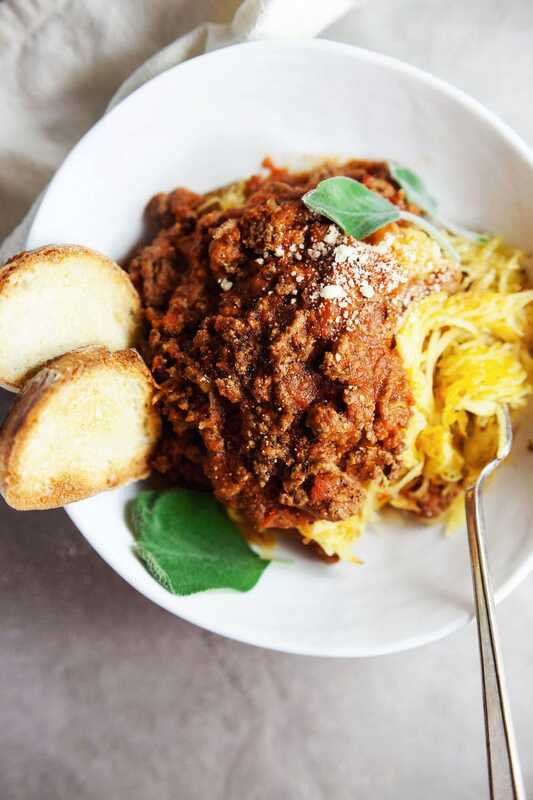 Serve spaghetti squash with bolognese sauce - sprinkle with cheese, favorite herb toppings and toasted french bread on the side! YUM. 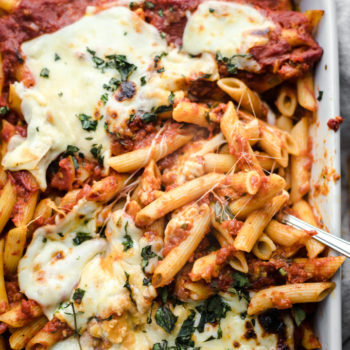 You can also use your favorite tomato sauce for this recipe.